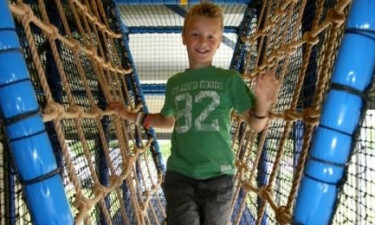 Whether you are tackling the climbing wall or keeping active on one of the sports facilities, Camping De Pekelinge delivers a memorable camping holiday for visitors of all ages. You can enjoy a luxury camping holiday close to beaches overlooking the North Sea and surrounded by scenic countryside. Situated south of Oostkapelle, this luxury camping site is only three kilometres from the sea. It is also just 20 minutes from Domburg by bike, which you can rent from the campground. Book your stay with LuxCamp and enjoy the great facilities of De Pekelinge. A supermarket is stocked with everyday essentials and free Wi-Fi is available throughout the site. You can enjoy drinks and meals at the campground’s café, restaurant or snack bar. Why Choose Camping De Pekelinge? Camping De Pekelinge is a wonderful holiday camping site with fantastic recreational activities and spacious mobile homes. From laser games to beach volleyball, you can enjoy diverse activities at this luxury camping site. An indoor playground includes a fun climbing wall with six different routes. A children’s club offers hours of fun for younger campers. No matter the weather, you can enjoy a swim at De Pekelinge’s heated pool. The unique swimming pool can be transformed with a cover to provide an indoor swimming experience during cooler or rainy days. 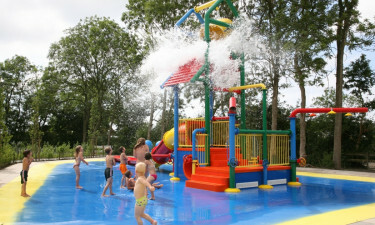 The campground's fabulous pool has an aquatic playground area just for little ones. There is also a wading pool for younger campers to splash around. For a thrill, the swimming pool has an exciting waterslide.